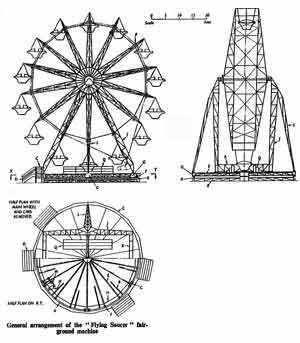 The wheel was designed by Henri Corbi�re, a French engineer, built around 1956 by ARM (UK) LTD. the design was state of the art at the time. As the wheel approaches its 50th birthday it still remains a beautifull example of efficient engineering design. The design was probably the first to have 'spherical motion' i.e. the whole wheel revolves around its base such that the gondolas travel in a gentle spiral path describing a sphere through space. This concept required new thinking in respect to the design and construction of the wheel. In order for the wheel to rotate in the horizontal plane, the whole structure is mounted on rolling bogies, which run on a circular rolled steel track. In previous Big Wheel design, each bearing of the axle is normally mounted on an upright column, which withstood the entire vertical load, and was usually stayed by three comparatively light inclined members. Such an arrangement, if used in this new machine, would have demanded a second set of rollers running on a circular track within the one already described; these rollers and their track being capable of carrying the weight of the wheel and standards concentrated at two points. This arrangement has been avoided by eliminating vertical standards altogether, and instead, supporting the axle by four inclined members with their feet pin-jointed to four of the roller bogie assemblies. If re-designed today, I suspect that this approach would still be valid, however with the introduction of structural hollow sections (SHS) the original tubular latice design, although of exeptional strength to weight ratio, would be replaced in favor of SHS. In addition the driving mechanism would likely be of the hydraulic friction drive type commonly in use today. An article which includes the above illustration as published in 'The Engineer' dated 1957 is available for download. 544kb @ 2.5 mins at 56kbs. Richard's wheel is the last fully operational ferris wheel of its type in the UK and possibly anywhere in the world!. If you know of another, we would love to hear of it's location. © Richard A. Ryan 2008.